Here at the Medical Universities of Gothenburg and Lund, we have in a large research study investigated how people deal with their daily life challenges and how that impacts their health. We discovered that the key to better health lies in the ability of some people to ask themselves small questions, those that inspire them to take a step back and respond with a new approach. We’ve now developed a web program with texts and activities so you can do the same. “How can I enjoy my lunch?" Do you want to try and ask questions to improve your health? "What small thing could make me healthier today?" PriusHealth is a research-based non-profit initiative that will radically change your approach to health. It is driven by Swedish universities focusing on lifestyle diseases and offers a new type of health support that has previously been lacking. It does this by providing daily thought-provoking questions that unlock how you relate to yourself, to others, the larger us, as the way to improve your health. Priushealth is now made available globally as both an open website and a guided program. 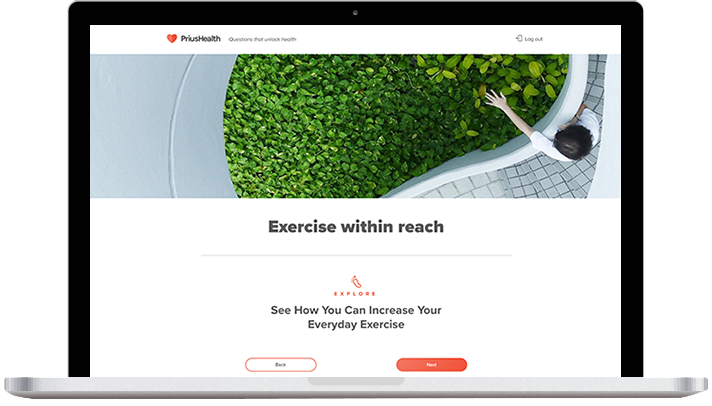 We are about to launch the full English version of the Swedish medical university initiative, PriusHealth, providing daily thought-provoking questions to unlock how you relate to yourself, to others, the larger us, as the way to improve your health. Available both as an open website and a full guided program, it will be launched summer 2017. If you would like us to keep you informed of its launch and thereby get free access to more content, then click here.